Fig.1 : (a) Unit cell of the semiconductor gallium arsenide (GaAs). Valence electron density in the grey plane of (a) in the (b) ground state (the electrons are in the valence band) and in the (c) excited state (electrons are in the conduction band). Fig. 2: The experimental concept is shown in the top. An example of such a THz waveform is shown below. The absorption of light in semiconductor crystals without inversion symmetry can generate electric currents. Researchers at the Max-Born-Institute have now generated directed currents at terahertz (THz) frequencies, much higher than the clock rates of current electronics. They show that electronic charge transfer between neighboring atoms in the crystal lattice represents the underlying mechanism. The smallest unit of a crystal is the so-called unit cell, a well-defined arrangement of atoms determined by chemical bonds. The unit cell of the prototype semiconductor GaAs is shown in Figure 1a and represents an arrangement of Ga and As atoms without a center of inversion. In the ground state of the crystal represented by the electronic valence band, the valence electrons are concentrated on the bonds between the Ga and the As atoms (Figure 1b). Upon absorption of near-infrared or visible light, an electron is promoted from the valence band to the next higher band, the conduction band. In the new state, the electron charge is shifted towards the Ga atoms (Figure 1b). This charge transfer corresponds to a local electric current, the interband or shift current, which is fundamentally different from the electron motions in intraband currents. Until recently, there has been a controversial debate among theoreticians whether the experimentally observed photo-induced currents are due to intraband or interband motions. Researchers at the Max-Born-Institute in Berlin, Germany, have investigated optically induced shift currents in the semiconductor gallium arsenide (GaAs) for the first time on ultrafast time scales down to 50 femtoseconds (1 fs = 10-15 seconds). They report their results in the current issue of the journal Physical Review Letters 121, 266602 (2018) . 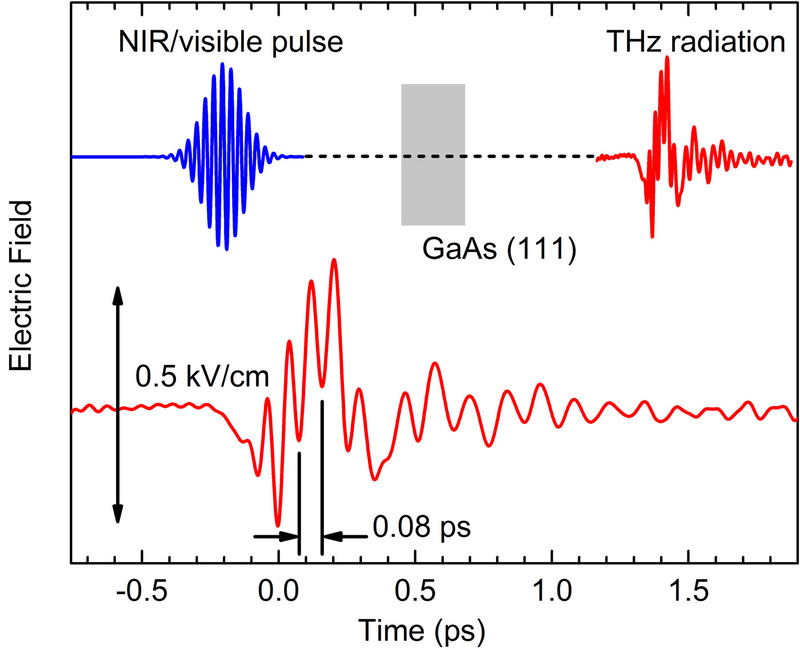 Using ultrashort, intense light pulses from the near infrared (λ = 900 nm) to the visible (λ = 650 nm, orange color), they generated shift currents in GaAs which oscillate and, thus, emit terahertz radiation with a bandwidth up to 20 THz (Figure 2). The properties of these currents and the underlying electron motions are fully reflected in the emitted THz waves which are detected in amplitude and phase. The THz radiation shows that the ultrashort current bursts of rectified light contain frequencies which are 5000 times higher than the highest clock rate of modern computer technology. Fig.1 : (a) Unit cell of the semiconductor gallium arsenide (GaAs). Chemical bonds (blue) connect every Ga atom to four neighboring As atoms and vice versa. Valence electron density in the grey plane of (a) in the (b) ground state (the electrons are in the valence band) and in the (c) excited state (electrons are in the conduction band). Apart from the valence electrons shown, there are tightly bound electrons near the nuclei. Fig. 2:The experimental concept is shown in the top. A short pulse in the near-infrared or visible spectral range is sent onto a thin GaAs layer. The electric field of the emitted THz radiation is measured as a function of time (1 ps = 10-12 s). An example of such a THz waveform is shown below. It contains oscillations with a period of 0.08 ps corresponding to a frequency of 12000 GHz=12 THz.